These Ras El Hanout Grilled Pork Skewers are tender, juicy and addictively delicious! This oh-so-easy Tapas recipe is not only fabulous as a tapas to serve with drinks but also makes a wonderful main dish! I recently returned from Spain… and I’m in love! The food, the culture, the music, the architecture…. and did I mention the tapas??? 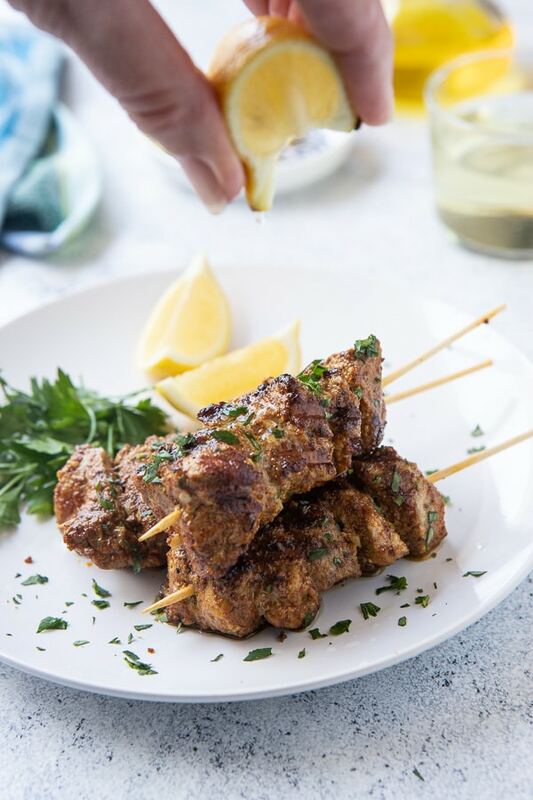 We tried a huge variety of Tapas on our trip and I can’t wait to share some of the tapas recipes with you all – like these These Ras El Hanout Grilled Pork Skewers. Known as Pinchitos/Pincho Murunos, these skewers are a very popular tapa in. Andulucia as well as the rest of Spain. In Spain they sell a spice mixture for Pinchitos – which is just a version of Ras El Hanout! Given that Spain was ruled by the Moors for over 700 years, it’s not surprising that North African cuisine had a deep and lasting effect on Spanish cuisine. 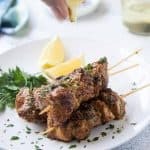 These skewers are truly addicting… we’ve had them at least two times since we returned – and so simple that even with a damaged finger I can still whip them up! But before we get into how to make these luscious skewers, a bit of background is in order! So what is Ras El Hanout? 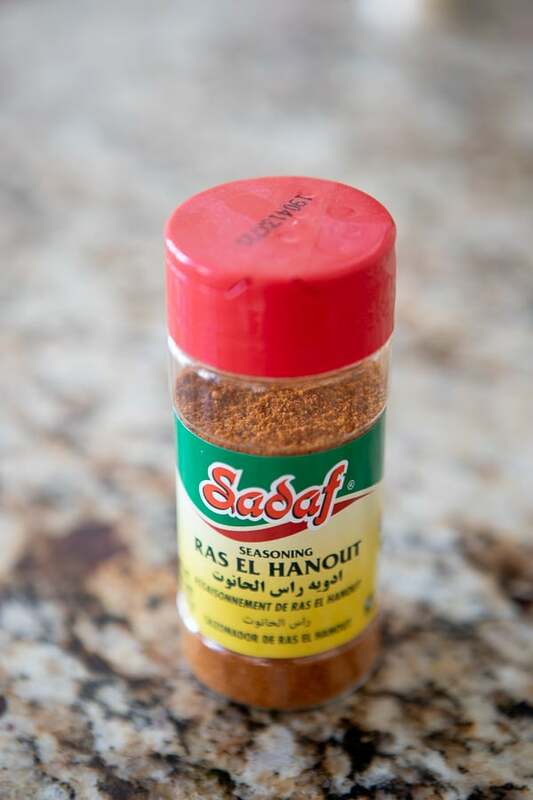 Ras El Hanout is a popular North African spice blend used throughout North Africa and especially in Morocco. The spice mix varies from family to family and shop to shop but generally combines cardamon,cumin,cloves, cinnamon, ginger, chile peppers, coriander, paprika and turmeric. This warm, pungent spice blend is terrific in marinades, rubs, and stirred into grain dishes and dressings. Easily made at home, you can also buy it ready made from middle eastern markets. As I said these skewers couldn’t be easier to make! Step 1: Remove the silver skin from the pork tenderloins. 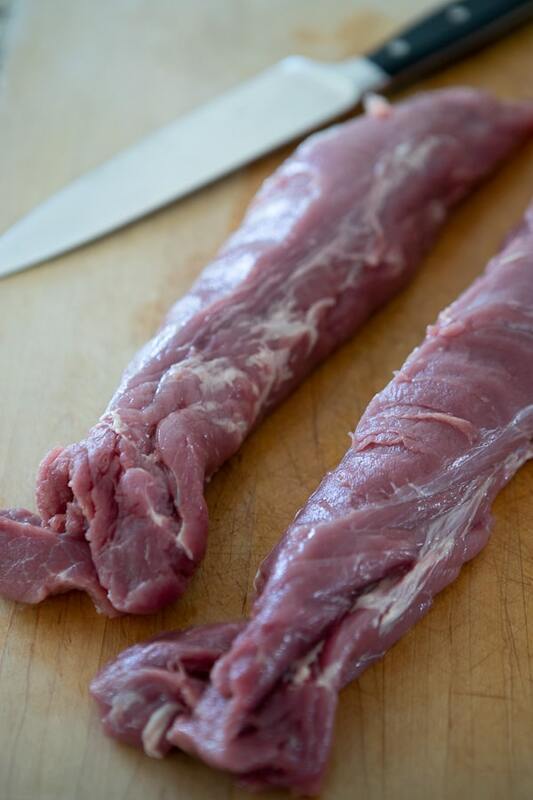 I use a small boning or paring knife to loosen the silver skin and at one end and then cut between it and the meat. Step 2: Next cut the pork into 1 inch chunks! 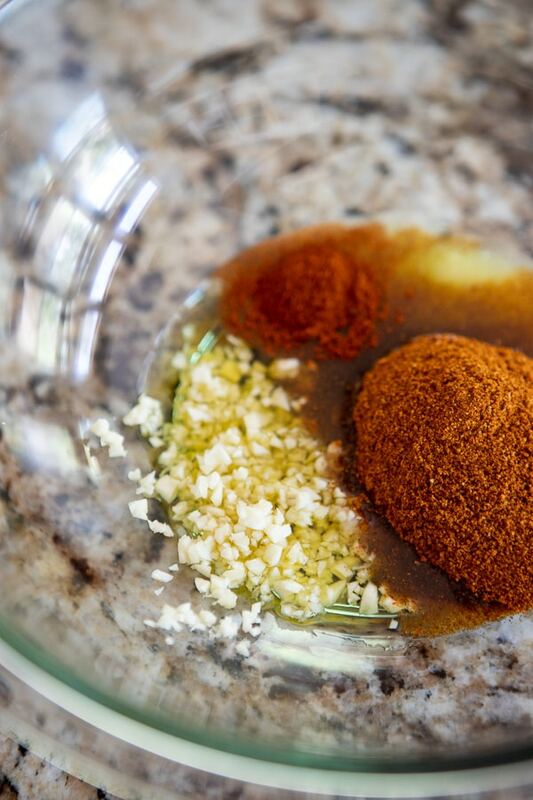 Step #3: In a large bowl, combine the olive oil, Ras El Hanout, minced garlic, smoked paprika , lemon juice and salt. Step #4: Stir to combine and add the pork. Stir to coat evenly and refrigerate for 2 – 3 hours or overnight if you can! Step 5: Remove the pork from the refrigerator and let come to room temperature. Soak the skewers in warm water for 30 minutes. Remove from the skewers from the water and thread the pork chunks onto the skewers. Pre heat a grill or grill pan to medium high heat, making sure to grease the grill so the skewers don’t stick. Grill for 10 – 12 minutes turning frequently until the pork is cooked through. Step 6: Serve 2 to 3 skewers as a tapas with squeeze of lemon and a nice Rueda! If you liked this post I would truly appreciate it if you left me a comment and a rating! Comments and ratings help me to keep this site running!! 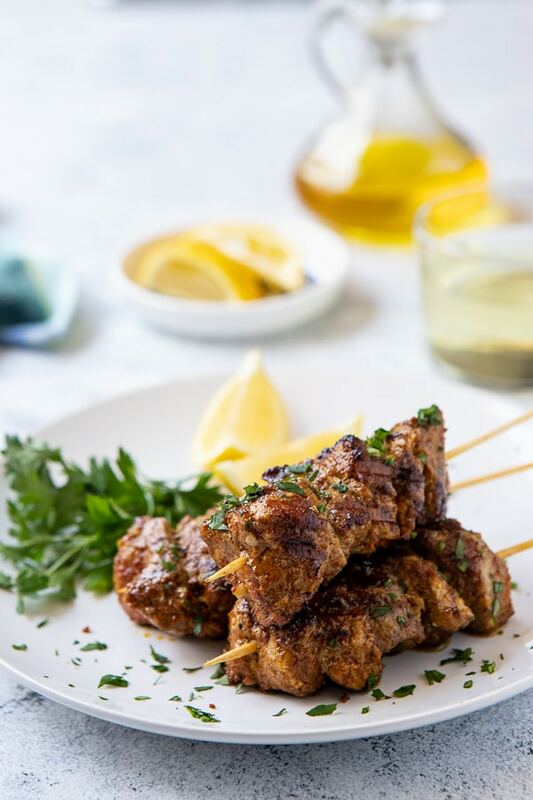 These Ras El Hanout Grilled Pork Skewers are tender, juicy and addictively delicious! This oh-s0-easy Tapas recipe is not only fabulous as a "snack" to serve with drinks but also makes a wonderful main dish! Remove the silver skin from the pork tenderloins. Cut the tenderloin into 1 inch chunks. 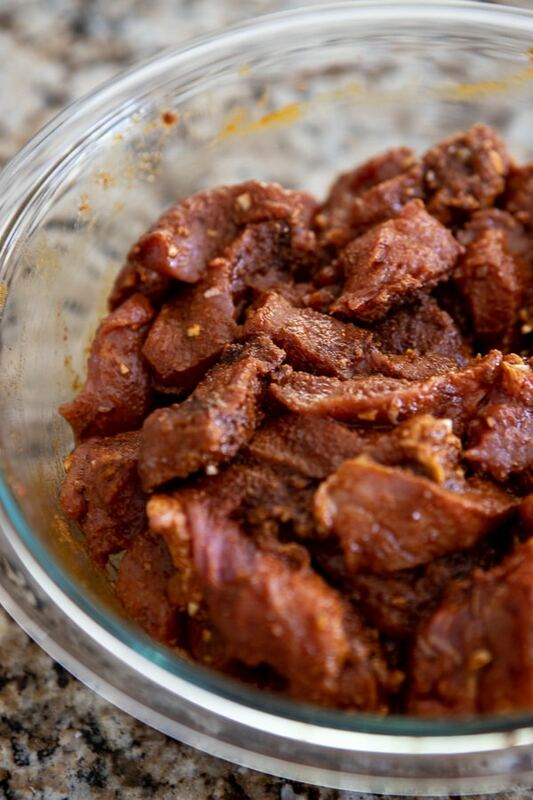 In a large bowl, combine the olive oil, Ras El Hanout, smoked paprika, salt, garlic and lemon juice. Stir to combine. Add the pork and stir until the pork is thoroughly coated. Cover the bowl with plastic wrap and refrigerate for 2- 3 hours or overnight. 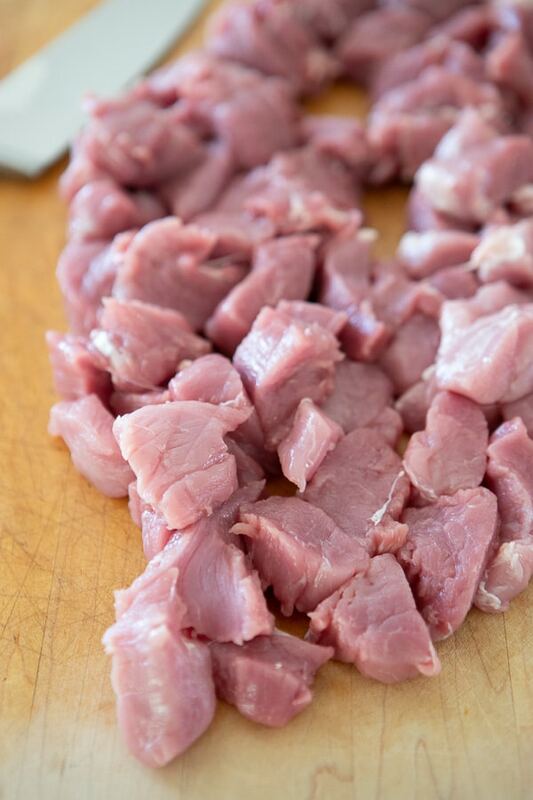 Remove the pork from the refrigerator and let come to room temperature. Soak the skewers for 30 minutes in warm water. Remove the skewers and thread 5 - 6 pieces of pork on each skewer. Pre heat a grill or grill pan to medium high heat, making sure the grill or grill pan is well oiled to prevent sticking. Add the skewers and cook, turning frequently, for 10 - 12 minutes or until the pork is cooked through. Serve with a wedge of lemon and garnish with minced parsley if desired. Combine all the spices together in a small bowl. Store excess in a sealed container in a cool and dry place. If you don't eat or like pork, this recipe also works with boneless and skinless chicken breasts or thighs. I recommend thighs because they will be moister! If you are making the Ras El Hanout, make sure your spices are fresh!!! This pork is full of favor! Sounds delicious! These skewers look amazing! Perfect for grilling season! Awww… thanks Tayler! Definitely great for grilling season – and so darn easy!!! I just love food on skewers!!!!! It makes me happy when I can just pick up a little kebab and enjoy it with my drink. These are just perfect for a summer party! Me too Claire! I think we’ll be making this a lot this summer! !